The "Events Monitor" is a new tool recently introducted in QuantShare. It allows you to monitor and catch different QuantShare events and generate alerts, execute scripts, send emails... based on these events. Note: All events except the first one are supported only in the real time version of QuantShare. More events will be added in newer versions. Please also note that you can use the script editor (Tools -> Script Editor) to create custom events. We will discuss how to do that in the end of this article. To start monitoring events, select "Tools" then "Events Monitor". This will bring a new form where you can select the events to display by clicking on the "All Events" button at the bottom. By default, all the events are displayed. At any moment, you can check the "Freeze" check box to stop updating the list. Each event comes with some attributes that are displayed in the "Values" column. The content or value of each attribute is displayed only if it is a numeric or text value. You will see something like "String" if the value is an array. In that case, you can access the different elements of the array using the Global script. More about this later in this article. 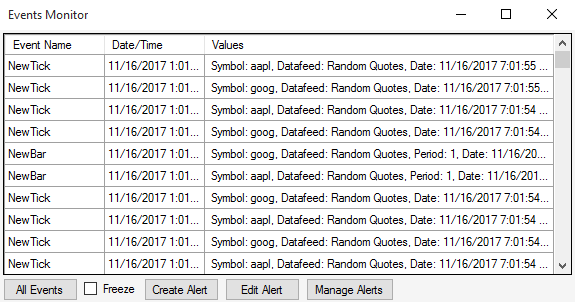 To create an alert for a specific event, click on the the "Create Alert" button at the bottom of the "Events Monitor" form. Conditions: Specify the conditions that must be meet in order to trigger the Alert. All conditions must be met in order to trigger the alert. For each condition, you must first specify the event name, the field or attribute to check (You can see the different attributes in the "Events Monitor" under the "Values" column), the operation (Contains or equals to) and then the "Value" that must be checked. // Generates a new event called "Hello" that has two attributes (Type and Value). To test the above examples, create two scripts with the code in the example one and two then select the "Example 2" script, select "Settings -> Add current script to bookmark panel". Execute the script from the bookmark panel then select "Example 1" and execute it directly from the script editor by clicking on the "Execute" button in the toolbar. More information about the bookmark panel can be found here. Note that you can access the event attributes using the "e" variable of type SubsribeThreadEventArgs.